Yeah, I bet you'd be pretty shocked if you opened up your bag and saw that, I know I was. You guys know I'm sometimes overly particular about how my food looks because I adore that wow factor when I first look at something, but there is no wow factor here. Not even a little. It looks like a plain (unfilled) poptart covered in a bit of streusel like topping. 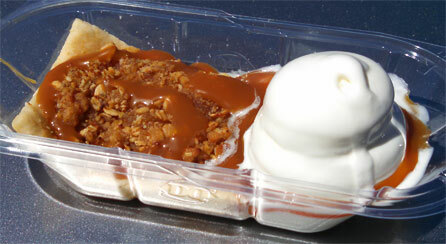 I wanted apple chunks, not a little apple puree mixed in with oats and caramel sauce. Now granted this may have only been the first (or second) apple tart the server made, so it may not have been perfectly configured, but that doesn't change the so-so nature of the components. Wait, before I rant, I should mention my wife took a few bites and thought it was fine, and yes, I will agree it's not terrible, but that foolish child inside of me wanted something epic. I didn't want some warm, dense plain pastry with a couple scoops of hot smush on top. I just found the whole experience so very flat and un-engaging. Maybe I'm spoiled... or maybe I wasn't in the right mood... or maybe, just maybe, this is not worth the price. Really has that "nailed it" epic fail quality, doesn't it? ha, yeah, it's tempting to say that but thankfully the ho hum flavor was better than the failed presentation. Sorry to read that you disappointing experience. I also hate it when the real product looks different than the advertisement, but this is why I tend to avoid restaurants. Wow, how utterly disappointing. Though I suppose we should have seen it coming. When does any fast food item actually look like what they've presented in a promotional photo? On a side note, if you have a Friendly around you, I highly recommend you try the Kit Kat Friend-Z with Cookies and Cream ice cream as the base. Blow your mind! I loved it. I thought it was great! I ate it and I would eat it again! I was thinking of why they don't actually use apple pie filling with chunks of apples? It looks like a hot mess. @Alek: that's exactly what I wanted... I definitely expected too much. 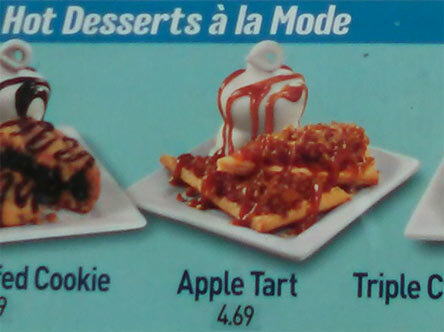 I tried the fudge stuffed cookie one...it looked a lot more like the picture than your apple tart did, and it was delicious! Ugh...The more I look at this, the more it ticks me off. The promo photo is so inviting. The pastry looks fresh and baked golden brown. The steamy hot mess they gave you looks pathetic and sad. The pastry looks soggy and microwaved, and it's just thrown together with no care whatsoever by whoever made it. This is the kind of thing I would return, and ask for a refund. Problem is this is an item NOT meant to be put in a bag or with a lid. This item is HOT and so the ice cream is going to melt, and forget about takeout orders. Plus, you cant put the softserve on the tart, again, its hot. The apple bake was delicious but 6 dollars and 60 cents? that was outrageous for what was there! Lucky if it cost 60 cents so there was 6 bucks profit! First and last time and Ill have to think twice about going to DQ again as well. @ICL: Where are you located? I'm curious about the giant upcharge from my price, no way this is worth over six bucks! I had the apple tart from the DQ in Natchitoches, LA. I thought it was delicious! The crust was buttery and flakey, there were plenty of apples and caramel. Not like grandma makes but pretty darn good. Will definitely order it again!! I work at DQ, and I can tell you that this worker definitely [messed] it up. But of course it's not going to be AMAZING, I mean, it's a fast food restaurant. hehehehe, I don't expect amazing, but I do expect tasty! I was obsessed with these and then just randomly one day they stopped serving them. 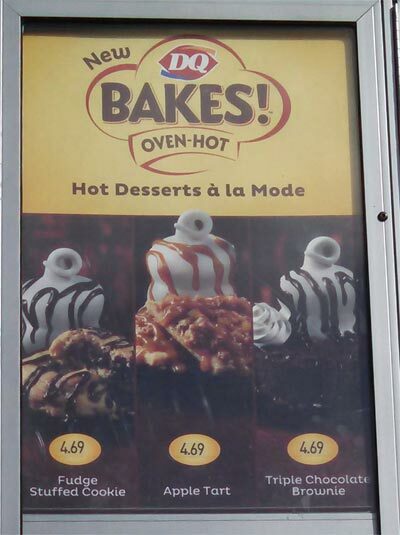 My dq in louisville ky said they dont find out until that day but that made no sense since they had a professional sign that looked exactly the same but with a caramel funnel cake in between the two other baked treats. It's still in dq's website so im confused. Are they discontinued everywhere else? Does anyone know? I would be dissapointed pretty often about the lack of Apple's, and at 3.99 it was a little expensive for what was there since I rarely touched the ice cream but it was a convenient fast food option for my fav baked treat. It's probably better I take it myself from now on any way. A diet of two of these a day and a bunch of water and nothing else is a horrible diet, so im probably better off but still sad and irritated at the no notice. These are still on the website. Maybe try to find another DQ in the area and call ahead to see what's up.